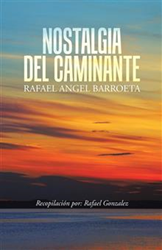 A Spanish-language book of poetry, “Nostalgia del Caminante” (published by iUniverse) is a collection of poetry by Rafael Angel Barroeta – a Venezuelan poet popular in the 1930s, 1940s and 1950s – now published by his nephew. “Realizing that my uncle's poetry has been a very valuable genre in his own country, I felt that everyone abroad should not miss it, so I endeavored to have his works published,” Barroeta’s nephew explains. A journey through Barroeta’s life, “Nostalgia del Caminante” communicates the feelings and emotions he experienced as he encountered his compatriots, landscaping the environment with precious metaphors. With the truth of spontaneity, the poems reflect a longing while providing lessons in dignity and lucid lyrics. y en luz nuestro nombre!